Now that I found a job where I get paid to write code, I might as well try to practice the language, eh? Over the past few months, in my quest to practice being a developer, I have been trying to come up with cute little side-projects in Java that I could do in my free time, and I have been reading more than a few textbooks to come up with ideas. I first heard of "Head First Java (2nd Edition, 2005)" back in February when I was interviewing for automated testing positions over at Harvard University. Although I didn't get the position, when the hiring manager and I exchanged emails afterwards he referred me to two books to help me brush up on my Java skills, long unused as a manual software tester. 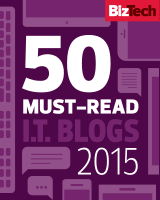 I was referred to: Murach's Java Programming ( Official Site) and Head First Java ( Official Site ). 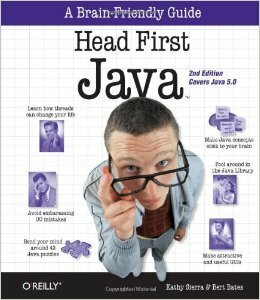 After reading a few sample chapters of each book, I went with "Head First Java". 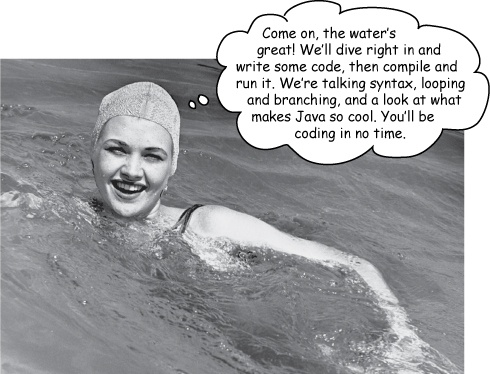 I have to say, I have never been so amused by a computer programming textbook! Thank you, Gray, for referring me to it! It talks about how Java manages memory, about creating multi-threading apps, sockets, user interfaces with Java's Swing library, and making music through Java's MIDI library but it does it in such a hilarious way that it cracks you up, with stock images from the 1950s, jokes, bad puns, and mock interviews with the concepts they are talking about. It's quite a funny book! After spending so much time with very dry texts studying, I found it to be a refreshing change of pace to get me back in the swing of things re-learning Java. Warning: They have a lot of cute graphics, like the ones above. My favorite code example of theirs was the BeatBox application found in their chapter on Using Swing, Java's built-in graphical user interface toolset. 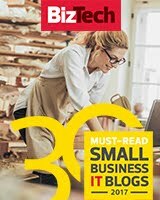 I remember getting into developing user interfaces as a Computer Science major, using Charles Petzold's textbook Programming Windows using C and Windows 95. When I encountered the Java's Swing library in my Advanced Programming in Java class in grad school, I found it a lot easier to work with. With the BeatBox app, they combine the Swing Library with Musical Instrument Digital Interface (MIDI) library as part of Java's Sound API. "The Java Sound API is a low-level API for effecting and controlling the input and output of sound media, including both audio and Musical Instrument Digital Interface (MIDI) data. The Java Sound API provides explicit control over the capabilities normally required for sound input and output, in a framework that promotes extensibility and flexibility. 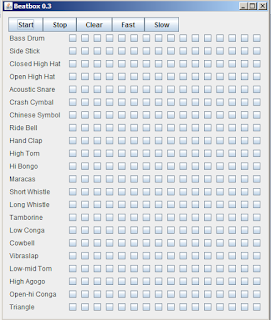 Setting up a list of sixteen percussion instruments, taken from the MIDI Percussion Key Map. Set up a Sequencer to play the music, playing the sequence chosen by the user. It's a fast tempo, 120 beats per minute. The tempo can raised or lowered by the user. 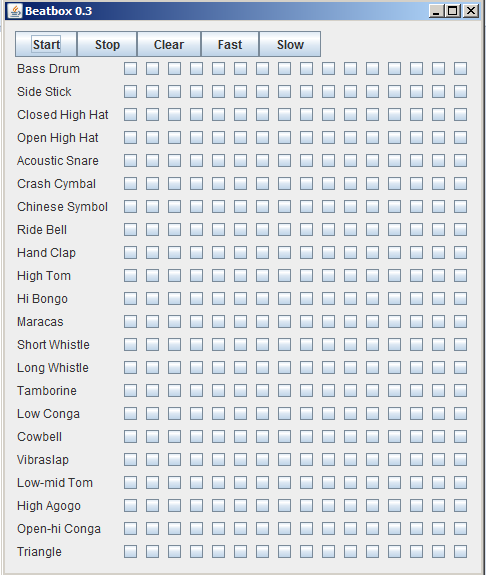 Set up a GUI with a list of the 16 percussion instruments the user can choose from in the far right column. By checking one of sixteen checkboxes for that instrument, the user crafts the sequence that will be played in a continuous loop. Listeners are placed on a Start and a Stop button to play and pause the beatbox. Even though you can download the sourcecode from the book, cutting and pasting what you need, I find it is easier for me to understand the code by manually typing the code out and experimenting with it. There are a lot more percussion instruments than the sixteen shown in the example. This makes the program flexible to recognize how many instruments are listed, by using 'Instrument.values().length'. Adding instruments to the Instruments enums adds or changes the list of instruments in the app automatically. I created a listener for the instrument checkboxes, so the new beat would play instantly, instead of waiting for the user to press 'Start'. I am still trying to figure out how to embed the Java app on an HTML page. Once I figure that out, I can place it here. You can view all the source code at https://github.com/tjmaher/BeatBox. Maybe after a few years of dabbling in little projects like this, I can become more proficiency in the language!